As part of our ongoing open source HR initiative (#HootHROS), this post outlines the steps we took to create a new recruiting data report for our executives. We use a variety of channels at Hootsuite to measure our recruiting activity: ATS data (iCIMS), Google Analytics, the dreaded spreadsheets, candidate and recruiter experience surveys, and more. No single source report was providing the level of visibility we wanted to provide our leadership team. That complexity gave us real challenges when we tried presenting data to our leadership team. An example of our old report. We clearly needed an update. Since one of our core values at Hootsuite is “build a better way,” we knew we had to take action. We decided to build an Executive Recruiting Report that compiled these disparate sources and told a global story about talent in a cohesive and visually appealing way. It took many months and multiple iterations, but we knew it was what the business needed. Here’s a breakdown of how we built it and what we learned along the way. A cleaner, cohesive report that presents a globally inclusive picture and narrative of our recruiting efforts. Increased visibility into our global recruiting operations for senior leadership, and better understanding of entire recruitment workflow. The ability to show department leads all of their global recruiting information in one report. Help Hootsuite leadership understand the recruiting funnel around the world so they have market intelligence and a better understanding of what goes into hiring efforts. Help provide visibility into the workload of our recruiters, the amount of time it takes to sift through all of the candidates and get 30-50+ hires per month. We first reviewed the reports we were currently producing and conducted an analysis with our business leaders to better understand what they were looking for, to make sure we were aligned. That process took several weeks, but we landed on key metrics the business wanted and we knew we could (eventually) provide. For this new Executive Recruiting Report to be successful, we had to ensure all of our global recruiters were tracking their activity in iCIMS, which we had just migrated to. This took a few months. We maintained our original reports during this transition, so we could track the consistency of the data over time. When the reports matched, we knew we were ready. Once we knew what data should be included and what it should look like, it was then a matter of building the visual representation and compiling the disparate sources. Web traffic and page views on the “Careers” section of our website. Conversion Rate (that is, the number of monthly unique career website visitors versus applicants). 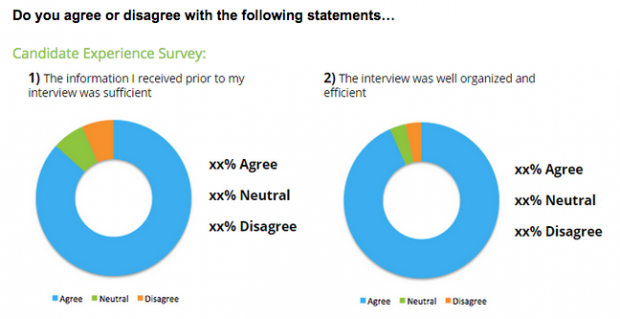 Candidate Experience Survey: Five questions emailed to candidates after they interview. Recruiter Survey: Sent to all new hires to gauge their satisfaction levels with recruiting experience. 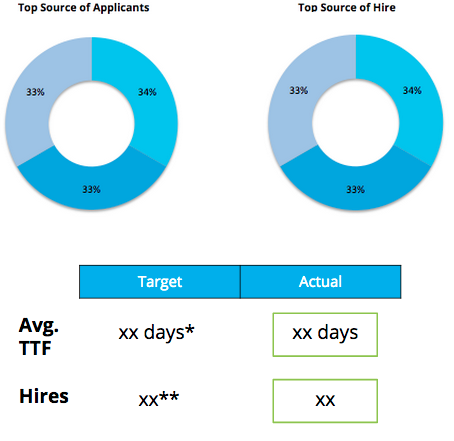 Feedback and market intelligence on declined offers and additional recruiting context for jobs open more than 50 days. After we collected the data, we needed to present it in a cohesive and visually appealing way. We used Google Slides to create templates for each of the key data elements in the report. Once the templates were built, we could easily plug in the data each month for that component of the report. Once we updated each of the templates, we used Mailchimp to compile the report and send to Hootsuite’s leadership team. Mailchimp allowed us to understand engagement, opens, and click-throughs to monitor the effectiveness and usage in each section. After the components and templates were built, it took about a full day to actually build the report. We created several versions of the report each month that provided visibility into all of our key business verticals: Global, Revenue, Product/Engineering, Marketing, and Core Support. We’d like to recognize two of our recruiting operations leads, Erica Rizzo and Emily Karras, who did a lot of the heavy lifting over the design and implementation process of creating this report. Thanks to both of them for bringing this to life, we couldn’t have done it without them. The leadership team was appreciative of the additional visibility into our global recruiting activities. The visual format allowed for easy comprehension of the data. The increased visibility of global and departmental activity was well received. We should have collected more global feedback before sending the report. We tried to get a deep global perspective during the needs analysis stage, but in hindsight we should have gone deeper. We should have given the recruiters more guidance in developing their narratives for local markets and aged jobs. We could have done a better job presenting global/local talent trends to help our leadership better understand the hiring climate in those areas. We need to do a more thorough job of answering the question: “what does this data mean?” Is it good, bad, or neutral? A huge takeaway for us was the realization that we weren’t limited to the data outputs of our recruiting technology. If it doesn’t meet your needs, build something that does. It takes time and effort, but the end result can help recruitment leaders become valuable talent advisors for the business. We’re sharing the process behind developing our new recruiting report and how we built it as a model of just one way it can be done. If you have models or templates that you’d like to share, send a Tweet and tag it with #HootHROS. For another look into the open source HR efforts of Hootsuite’s HR and recruiting team, read our case study on How To Design And Execute A Global Employer Brand Campaign In 5 Days. Want to see our new recruiting report? Flip through or download the Slideshare below. Derek is Hootsuite's Talent Acquisition Manager, responsible for leading global growth. You can connect with him on Twitter at @DerekIsley.